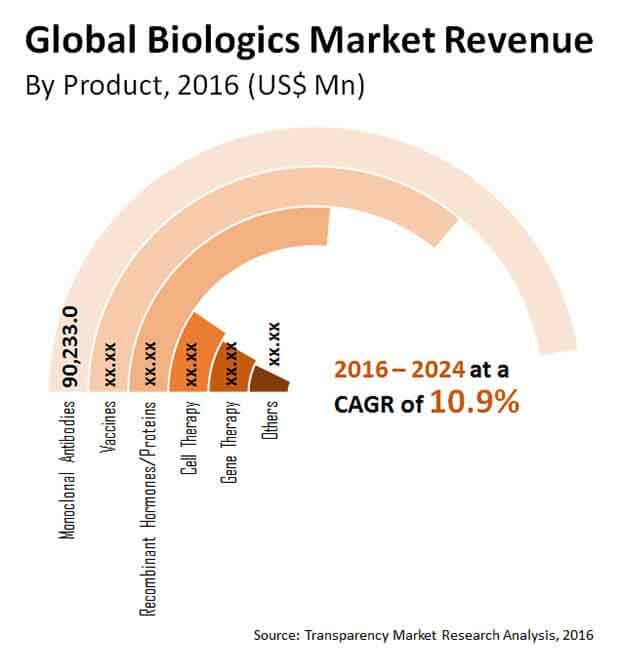 The global biologics market has been displaying an aggressive competition divided among a handful of household organizations and a decent count of world’s best pharmaceutical companies. You could see such players competing among themselves to win an offer in this highly productive market. Transparency Market Research (TMR) has foreseen top players to upgrade their product portfolios with the help of bargains and co-improvement exercises as they get involved in strategic mergers and acquisitions. Players have also been observed to grow their assembling units and services across the globe. Biologics has witnessed billions of dollars put in by pharmaceutical behemoths such as AstraZenca, Novartis, and Eli Lilly and Co. If the expected CAGR of 10.9% holds true for the global biologics market between 2016 and 2024, the revenue valuation could ascend to a US$479.7 bn by the end of the forecast tenure, as per a TMR report. In 2017, the market had paraded a valuation of US$231.2 bn. By product, the segment of monoclonal antibodies has been envisaged to rank higher while growing at an 11.9% CAGR. By 2024, North America could bag a share of more than 40.0% of the market. Analysts authoring the report have foretold the world biologics market to find greener pastures created with constant efforts and collective investments directed toward the development of biologics with specific applications. An over US$1.5 bn have been invested by top 10 pharmaceutical giants in the past five years, which has translated into capacity expansion and focused research and development. Drug companies have been earning strong profits through premium prices increasing their profit margins somewhere between 20.0% and 40.0%. Factors such as product approvals and the ability of biologics to successfully treat significantly complex diseases, which was close to impossible earlier, have been key for market growth. Pharmaceutical firms patenting biologics products have been anticipated to make healthy gains in the coming years. With the robust growth in the biopharmaceutical industry, an over 13% of biomolecules that enter phase I of clinical trials have been expected to be likely approved as a drug. Increasing annual product approvals and strong biologics pipeline has been an indication of a robust development of the world biologics market. Compared to conventional drugs, biologics have had a higher success rate in terms of approval. However, high capital investment required for research and development could hamper the demand in the international biologics market. Only biopharmaceutical firms have been observed to enter the market due to costly initial setup. A success product launch primarily requires an over US$1.0 bn investment and takes approximately 9 years. Moreover, the regulatory approval of biologics is quite detailed since the molecules are complex. On the other hand, the approval process of substitutes such as biosimilars has been made easily accessible by regulatory agencies. Furthermore, biosimilars offer cost savings while being priced at a 30.0% to 40.0% lesser cost than the original products. Taking advantage of patented timeframes, biologics manufacturers usually sell their products at high prices, which most of the patient population may not be able to afford. During such a time, manufacturers could face some competition due to the lower cost of generics. Nevertheless, the report has shed light on key trends and opportunities that have been predicted to help gain profit in the near future. For instance, establishing integrated facilities in high potential markets, the presence of contract manufacturing organizations (CMOs), and the use of biologics as a preventive medicine could help players to sustain their growth in the market. Pharmaceutical companies to stretch their profit margins with premium pricing. Extortionate capital investment and long product launch process to dent rise in demand.